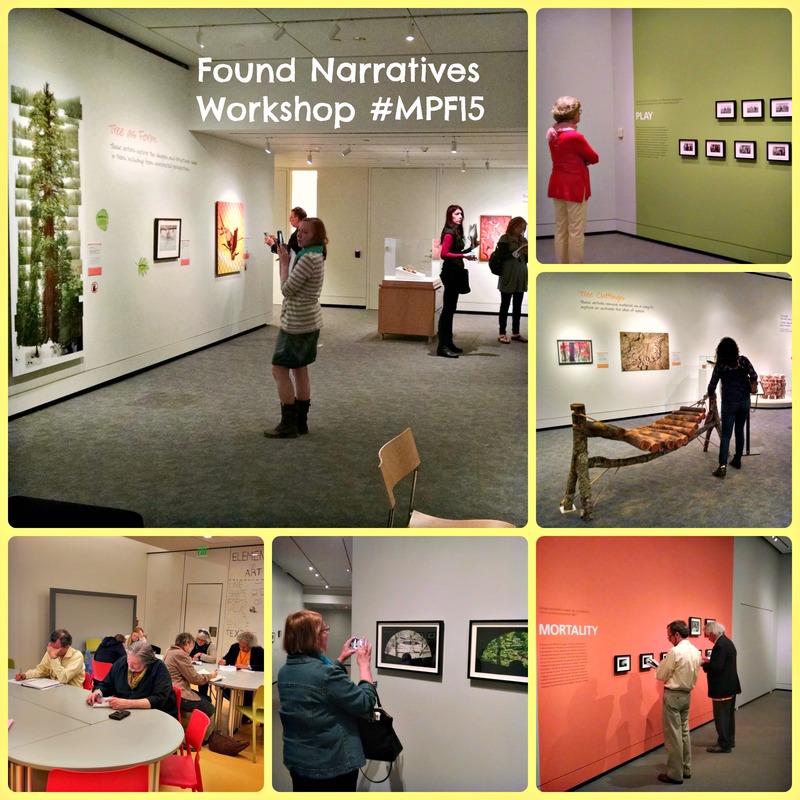 I have lots of thoughts about the last few days of the Mass Poetry Festival, so expect those in a subsequent post, but first I’d like to say ‘thanks!’ to everyone who attended my workshop “Found Narratives” on Sunday morning at the Peabody Essex Museum. I promised I’d put my presentation up online, so the slides are below, with a summary of the ideas that kicked off our writing session. What is the role of curators in creating an exhibition, and how is that like (or unlike) the role of a poet? Caretaker/Historian/Preservationist – all exhibitions are a continuation of, response to, or rejection of previous history (art history, historical narrative, etc.) By choosing to include objects, artworks, etc. in a show, curators demonstrate that they think these particular things are worth saving, displaying, and sharing. Author/Editor – curators pick which exhibition elements will best help them tell the story of the person/place/time period/movement/historical event that they want to tell. Interpreter – A good curator (through a good exhibition) poses questions, invites discussion, offers new perspectives, and has an impact on the viewers that gives them a brain-tingling set of new ideas and questions of their own. Historian – all poetry draws inspiration from, responds to, rejects, or reworks the written (and oral!) canon and literary tradition that preceded it. Play and challenge are vital acts of the poet-as-historian. Author/Editor – words are a poet’s tools, and which words you pick and which words you juxtapose, emphasize, etc. are the keys to creating a poem with impact. Interpreter – “If it blows the top of my head off, I know it’s Poetry.” Emily Dickinson was right on, IMHO. Just like visual art, a good poem makes the reader think, question, observe, react, feel, breathe a little differently than before they encountered the words. The power of both of these roles is in the choices that we make. Blank walls, blank paper, blank screen. You can put anything there in any order, so where do you start? It all depends on the impact you want to have. Are you aiming for accessible or inscrutable? Mysterious? Open? Comforting or confronting? Your goal determines your choices as much as your natural voice does. In the case of an exhibition, there are numerous voices involved, of course. Aside from the curator, there are exhibition designers, an interpretive editor, often an educator, all offering suggestions which will help highlight and shape the story the curator wants to tell. The team’s choices form the bridges for the connections visitors will make when standing in the space. Will there be long sight lines or lots of small spaces? Which pieces are in conversation with each other, whether in support or in opposition? Do you hang them together or separately? What color are the walls? How much extra information do you put on the labels/wall text? What style font do you use? For poets, this correlates to choices about line length, word juxtaposition, rhyme and meter, form. Where do you want your viewer’s/reader’s eyes to go next? Find 1-2 works in each of the exhibits that really sang to them, for any reason at all. Brainstorm a list of words and phrases provoked by each work. Once back in the studio, find a connecting thread between the 2 works. Write ‘the bridge,’ aka, draw out the connection and give it support using the inspiration from the two artworks. Using Visual Thinking Strategies, we spent a few minutes in each gallery as a group looking at one art work. I asked only three questions (“What do you see?” “Why do you say that?” and “What else?”), and let people build upon their own and others’ observations to discuss the work in front of them, then let them go to explore each gallery. I picked this show because Michals often treats his photographs as a storyboard: there’s a lot of narrative, sometimes with his own reflections, stories, memories, and poems written directly on the surface of the print. He has a playfulness to a lot of his work that I find appealing, and many of his themes tie easily into poetry (time, mortality, desire, wonder, discomfort, humor). This show focuses on the way artists use trees as both artistic material and as inspiration. There are many more abstract works in this exhibition, and lots of themes about the ways humans relate to their environment. On their own time, I encouraged participants to explore the rest of the museum as well and try this exercise again. Participants then had about 15 minutes to work on their poems, and time at the end of the session to share their favorite lines (or the whole poem if it was short). About half the workshop chose to share, and I was really impressed with the vivid language, the fantastic imagery, and the unusual connections they made. I was also pleased, amused, and a little surprised that a few people chose an interactive element (an amadinda, similar to a log xylophone) instead of an artwork for their second piece. I had, after all, asked them to find a piece that ‘sang’ to them–a few took me quite literally! Do you find visual art a stimulus to your writing? Would you try this exercise or share it with your students/writing group? Have you tried it and do you have a result to share? Add your thoughts to the discussion in the comments below! This entry was tagged convention report, mass poetry festival, mpf15, peabody essex museum, poetry, presentation, teaching writing, workshop, writing, writing prompts. Bookmark the permalink.